Rottweilers are known for their barking. That is what makes them such great guard dogs! So teaching your Rottweiler to speak on command should be a simple and fun exercise for the both of you. 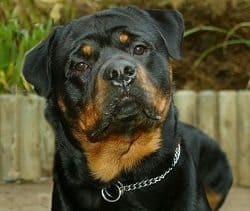 Rottweilers are naturally loyal and obedient dogs. They want nothing more than to please their master. 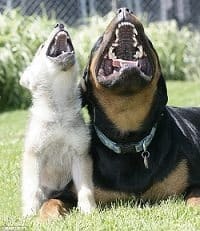 It is very important not to forget to teach the “quiet” command also, because with how much Rottweilers are known for barking, you may need to tell them to be quiet from time to time. This will be a fun training exercise for the both of you, but to teach “quiet” it can be a little frustrating, so if they don’t get it right away, just understand that this command will take some patience for the dog to fully understand the concept of being quiet. Neither of these commands can be taught through visually showing them, or physically demonstrating, so remember that you must help the dog along as much as you can, and to be extra forgiving and patient if they are not grasping the concept. First, you need to utilize what you have on hand. If your Rottweiler is notorious for barking at the doorbell, you can use that to teach them this command quite easily. When the doorbell rings and your Rottweiler begins to bark, say “speak!” as they are barking and immediately give them praise, a treat, or throw them their toy as a reward. You can continue to practice this command if you have a friend with you. Have your friend stand outside your door and press the doorbell. Keep doing this while telling the dog to “speak” and giving them praise until they do so without having to use the doorbell. If you do not have a doorbell, don’t fret. This is still going to be an easy command for a barker like the Rottweiler to pick up on. Get your Rottweiler’s attention with a toy or a treat. Get them excited about it. Make a spectacle of it if necessary. This will get them all riled up and then make them sit for you. Make sure you also use their name. To make it easy, I will name my imaginary dog “Rott.” Once you have the dogs attention, say in an enthusiastic voice, “Speak, Rott!” And if the dog even makes a grunt or blows their lips, give them good praise and give them the treat or toy you have been showing them. Continue to do this until you can actually get the dog to bark. This may take several sittings for you to teach them this command, but it is generally not a command they will easily forget, because Rottweilers love to bark. Now that your Rottweiler has learned the “speak” command, we can teach them the “quiet” command. This command will not be quite as easy to teach them. It may take a little more practice and patience. Your Rottweiler’s first instinct is to think you are asking them to speak. They may speak instead of getting quiet for you because they are expecting you to ask them to do something for you, when infact, you are actually asking them to do nothing at all. If they bark instead, simply say, “no, Rott. Quiet, shh.” This may take longer for them to understand, and that is ok. The last thing we want to do is unintentionally confuse the dog. So it is your job to be extra patient with this exercise. If you still have not mastered “quiet,” try it again. Make your Rottweiler bark with the “speak” command first, and throw them one small treat. Then, ask them, “quiet, Rott. Shh.” And if they don’t make any noise, instead of giving praise with one small treat, give them three treats. Now that they have the concept down, ask them the “speak” command, but this time, just pat them on the head for a reward. Ask them the “quiet” command next, and if they are quiet, throw them three treats again. This will teach your Rottweiler that keeping quiet gets them a greater reward. This will help to encourage them to keep quiet. If they are quiet, you throw them treats! If you bark, you just get a pat on the head. We all know that the Rottweiler knows how to bark. Keeping them quiet is the real challenge!